My name is Will Oxford, and you can reach me by email at wroxford at gmail dot com. Don't hesitate to send any comments, questions, corrections, suggestions, criticisms, or even compliments. I created this website for people like me: fans of the Hardy Boys books. I've divided the pages into two main categories: "Series Info" (information about the books), which deals with the technical and historical side of the books, and "Literary Info" (inside the world of the Hardy Boys), which deals with the literary side. You might say that "Series Info" is for collectors, while "Literary Info" is for readers. 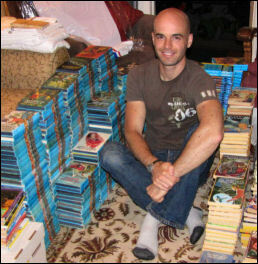 Of course, since most Hardy Boys fans are both readers and collectors, I hope you'll find lots to interest you! I simply don't have enough knowledge to list in-depth technical information about editions and printings, ghost-writers, illustrators, collector's editions, merchandise, and so on. Besides, these subjects are treated thoroughly on R. W. Finnan's excellent Hardy Boys web site, and there's no need for me to duplicate that information here. Instead, I hope to offer my own insight and discussion of the more literary side of the books - the stories and the characters. All original content on this website is copyright © 1997-2016 by me, Will Oxford. If you would like to use material from this website, please e-mail me about it first. I will be happy to allow it, as long as you clearly identify this website as the source.